The Paris couture house Callot Sisters was founded in 1895 by four sisters, Marie Gerber, Marthe Bertrand, Régine Tennyson-Chantrelle, and Joséphine Crimont, at 24, rue Taitbout. The sisters came from an artistic family; their mother was a talented lace maker and embroiderer, and their father, Jean-Baptiste Callot, was an artist who came from a family of lace makers and engravers (including the esteemed seventeenth-century artist Jacques Callot) and taught at the École nationale supérieure des beaux-arts. Before opening the couture salon, the sisters owned a shop that sold antique laces, ribbons, and lingerie. Madame Gerber was generally acknowledged as the head designer and had worked as a modéliste (a designer who works under the house name but is not credited) with the firm Raudnitz et cie. By 1900 Callot Sisters was employing six hundred workers and had clientele in Europe and America. 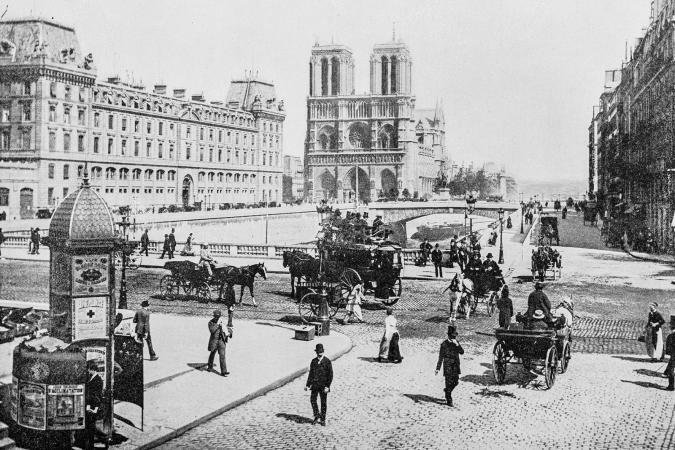 The house's inclusion in the 1900 Paris Exposition Universelle, where it displayed dresses alongside such venerable couture firms as Doucet, Paquin, Redfern, Rouff, and Worth, demonstrates the sisters' respected place within the industry. A number of designers, including Madeleine Vionnet and Georgette Renal, began their careers at Callot Sisters before launching their own couture houses. According to Vionnet, who worked at the house from 1901 to 1907, Madame Gerber was a friend of the art collector and critic Edmond de Goncourt, with whom she shared an interest in the Orient and eighteenth-century rococo design. The decor of the sisters' salon reflected these two influences, and they received their clients in a Chinese-style room adorned with Coromandel lacquer, Song dynasty silks, and Louis XV furniture. The house's design repertoire encompassed daywear, tailored suits, and evening dresses, but it was best known for its ethereal, eighteenth-century-inspired dishabille and exotic evening dress influenced by the East. The sisters' luxurious tea gowns, produced in the early part of the century, were made of silk, chiffon, and organdy and often incorporated costly antique laces into their designs. Their penchant for such delicate materials prompted Marcel Proust to write, in Remembrance of Things Past, that the sisters "go in rather too freely for lace" (p. 675). Their layered, filmy, pastel-toned garments were very fashionable; such contemporaries as Jacques Doucet and Lucile also created such "confections," as they were often described. In the 1910s and early 1920s the house's garments also drew upon the brilliant fauvist colors and Eastern-inspired design that were a vital part of the visual culture of the period. While this exotic mode is commonly associated with the designer Paul Poiret, the sisters also created clothing that incorporated embellishment and construction techniques derived from Asia and Africa. Some of these dresses (sometimes referred to as robes phéniciennes) integrated design elements from the two continents into one garment. For example, a kimono sleeve might be used with an Algerian burnoose form. Madeleine Vionnet recalls that the adoption of the kimono sleeve was Madame Gerber's innovation and that she was incorporating the cylindrical sleeve into art nouveau dresses in the early part of the century. The year 1914 was significant for the design house, in that it marked both a move to 9-11, avenue Matignon and the sisters' involvement in Le syndicat de défense de la grande couture française. 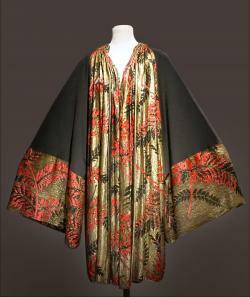 Through this organization, Callot Sisters, along with the designers Paul Poiret, Jacques Worth, Jeanne Paquin, Madeleine Cheruit, Paul Rodier, and Bianchini and Ferier, put in place controls to protect their original designs from copy houses that sold them to ready-to-wear manufacturers without their permission. This is the period when the Callot Sisters, and many other designers, began to date their labels. While fashion activity in Paris subsided somewhat during World War I, the house of Callot remained open, and the sisters continued to promote their clothing in America by exhibiting at the 1915 Pacific Panama International Exposition in San Francisco, California. By the 1920s the house also expanded its operations to include branches in Nice, Biarritz, Buenos Aires, and London, further extending the international recognition of their label. Callot Sisters remained active throughout the 1920s and participated in the 1925 Exposition internationale des arts décoratifs et industriels modernes in Paris, along with Jeanne Lanvin, the house of Worth, and the jeweler Cartier in the Pavilion of Elegance. By 1926, however, the fashionability of the house was on the wane. The American designer Elizabeth Hawes, who was working as a copyist in Paris in 1926, writes of dressing herself at Callot for some time and "getting some beautiful bargains in stylish clothes which lasted me for years. I had an extra fondness for Callot because the American buyers found her out of date and unfashionable. She was. She just made simple clothes with wonderful embroidery. Embroidery wasn't chic" (Hawes p. 66). The sisters retained their interest in fashionable detail and luxurious materials even when the more graphic lines of the art deco silhouette were in ascendance. "There are very few firms at present, one or two only, Callot-although they go in rather too freely for lace-Doucet, Cheruit, Paquin sometimes. The others are all horrible.…. Then is there a vast difference between a Callot dress and one from any ordinary shop?" Albertine responds that there is a great difference because what one could buy for three hundred francs in an ordinary shop will cost two thousand at Callot soeurs (Proust, p. 675). In 1928 Madame Gerber's son Pierre took over the firm and moved it to 41, avenue Montaigne, where it remained until Madame Gerber retired in 1937. At that time the company was absorbed into the house of Calvet, although labels with the Callot Sisters name appeared until the closing of Calvet in 1948. 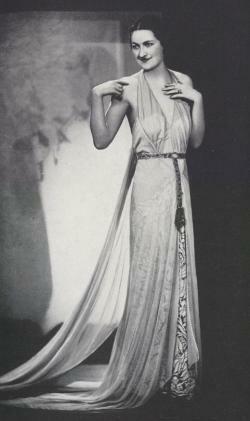 See also Art and Fashion; Haute Couture; Orientalism; Paris Fashion; Marcel Proust; Madeleine Vionnet. Chantrell, Maria Lyding. Les Moires-Mesdames Callot Soeurs. Paris: Paris Presses du Palais-Royal, 1978. Elizabeth Hawes. Fashion Is Spinach. New York: Random House, 1938. Milbank, Caroline Rennolds. Couture: The Great Designers. New York: Stewart, Tabori and Chang, Inc., 1985. Marcel Proust. Remembrance of Things Past. Vol. 2: Within a Budding Grove. Translated by C. K. Scott Moncrieff and Frederick A. Blossom. New York: Random House, 1927-1932.